This volume is a record of the Coinage of the Americas Conference (COAC) held in 1989. This volume is a record of the Coinage of the Americas Conference (COAC) held in 1992. This volume is a record of the Coinage of the Americas Conference (COAC) held in 1993. This volume contains papers drawn from the Coinage of the Americas Conference (COAC) held in 1994. 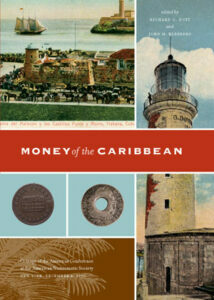 This volume is a record of the Coinage of the Americas Conference (COAC) held in 1998. Papers presented at the 1999 Coinage of the Americas Conference (COAC). This volume collects together the papers presented at the Coinage of the Americas Conference on Mark Newby and the St. Patrick coinage, held in 2007. The papers address a wide variety of questions that have dogged the study of the St. Patrick series since the eighteenth century. Included here are new approaches to the major problems of metrology, iconography, and chronology, as well as the divisive issue of who was actually responsible for the production of this enigmatic Irish coinage. 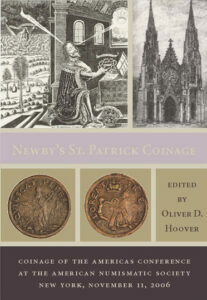 An important survey of the various forms of money used in America in the seventeenth century serves as a background for the circulation of the St. Patrick coinage in West Jersey, while the final paper offers a reassessment of Mark Newby and his importation of the coinage to America. An appendix presents all of the St. Patrick coins in the collection of the American Numismatic Society. A record of the Coinage of the Americas Conference (COAC) held in 1985. This volume is a record of the Coinage of the Americas Conference (COAC) held in 1997.